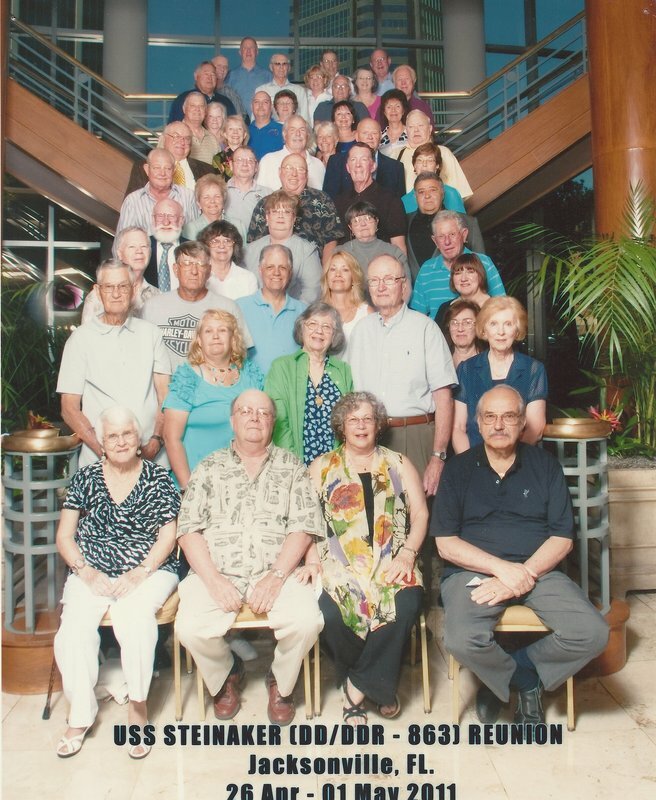 Our 19th annual reunion was held this year in Jacksonville, FL. We had 54 attendees which included 30 shipmates. The activities included a tour of Mayport Naval Station and the Anheuser-Busch Brewery. Saturday we held the annual business meeting. Russ Noble was elected the new secretary-treasurer. The additional category of a life membership fee of $100 was approved. The 2012 reunion will be in Virginia Beach area. The 2013 reunion will be at Fall River, MA. Saturday evening was the annual banquet and "live auction" with addtional entertainment. Everyone had an enjoyable time in Florida. Evans and Russ and Virginia Noble for their efforts in securing such great accommodations. As you might expect, early arrivals included Russ and Virginia Noble who spent the entire month of April in their camper which was sited on the Mayport Naval Base. A retiree benefit, I suspect. This gave Russ a base of operation to tend to the last minute details of the reunion which are always endless. Jim and Muriel Bunch were able to make it early, although, given Jim’s past history of hyperbole (to say the least), his tale of driving through basketball sized hail, winds in excess of the Beaufort Scale, oceans of water and no visibility left us somewhat skeptical. The only truth to emerge from his story was possibly his statement that he tried to hide under bridges whenever he could. Michele and I were able to show up on Thursday because we were visiting family in the area. Fred and Peg Payne had Joe Tucker staying with them so both had only to come the short distance from St. Augustine. Al Fochtman tried to fly out of Portland Maine but was beset by flight cancellations due to the weather. I have his assurance that he will be present next year in Virginia Beach. Thursday evening saw the onset of the traditional “story telling” at which time experiences and events were revisited. Some came from the misty past of over 60 years ago but all were able to transport us to a time long past. One in particular which occurred in 1964 is still fraught with controversy. Impartial witnesses cannot be found and the two principals still cannot reach agreement. The facts are indisputable. A 1959 Porsche 356 normal sporting a whopping engine of 1600cc and driven by yours truly DID in fact beat the 1964 Chevy of 409 cubic inches piloted by Jim Bunch in a drag race conducted on Military Highway. Doing the simple conversion, the Chevy had the equivalent of 6702.309176 cc’s! An engine 4.18 times the size of the little German upstart. However, putting aside the issue of automobile construction quality, the argument by Bunch that “my gas pedal fell off” seems specious at best. Some new participants this year included Jack Cashman , Dave and Debra Lane, Al and Helen Blanks ,Larry and Ann I’Anson, (note to Ann - the all female crew of the nuclear sub was found to be just that...a rumor) Ken and Thelma Kohnen, Rick and Donna Milstead, Jack and Gloria Parsons, Marty Martinez, Joe Pierotti, and George and Karin Williams and my personal guests, son Michael with wife Natalie and granddaughter Oona. paid for by the U.S. Navy under various education programs. Upon completion of her talk we were shown the new base housing. The most amazing part was the housing available for enlisted men for occupation while their ship is in port. The facilities somewhat resembled a college suite of rooms. However, these rooms have state of the art washers, dryers, flat screen televisions and full cable and internet hook-ups. Not the same as the seedy rental lockers we were subjected to and had to pay for in order to have civilian clothes to wear on liberty. The next event on our tour was a stop at the campsite of Russ & Virginia Noble. Russ said he had to speak to someone named John about a hookup. Fortunately for us it was a short diversion and we were surprised to learn that the Navy runs an RV campground! Apparently Mayport is not the only one either. Some quite nice digs to say the least. Navy pay must have increased from the couple hundred bucks a month we received. The PR explanation we were given said something to the effect that “things have to be done to attract and keep qualified personnel.” The final treat of the base tour was a trip to the Navy Exchange. Here we were able to make some purchases from a quite diverse retail selection. Personally, I opted for the wine department but others made more sensible choices. Moving on to the Budweiser brewery, our group enjoyed a pleasant afternoon watching how Anheuser-Busch makes beer. The tour guide covered what seemed like the entire history of beer brewing starting with ancient Egypt and culminating with the process employed by Budweiser. Interestingly, the equipment that measures the fullness of the bottles was likely supplied to Budweiser by shipmate Joe Tucker’s company. At the end of the tour we were allowed two glasses of the beer of our choice. A nice touch. A short bus ride later and we were at the end of our tour and back at the hotel. Friday evening most attendees had dinner in the hotel. It turned out that this Omni property had a quite respectable restaurant. Many chose to not leave and search for outside restaurants for most of their meals. After dinner those in attendance were treated to what was billed as a special presentation. In fact, it was an unusual event in that it was an interview with a two headed man. As the interviewer, I was able to ask our two headed guest such pertinent questions as: What is your name?, Why do you want to join the Navy?, How do you think you will be able to relate to female crew members?, What will happen if you have 2 different rates?, How will you carry out an order if you have two different ranks?, and finally, in which berthing space would your body reside?. Answers to the above questions would be as one would expect from a body composed of Jim Bunch and Russ Noble. Next year, rehearsals will be mandatory. The remainder of Friday evening was spent watching Joe Tucker bring various attendees up to speed in the operation and use of various Apple products. This included downloading apps, reconfiguring machines and teaching the intricacies of Face Time on the iPhone, iPad and iPods. One would think that Joe was getting paid commissions by Steve Jobs. evening festivities culminating in our traditional auction were set to begin. Unfortunately, an altercation broke out between myself and Jim Bunch. As a matter of fact it got quite heated with the main issue being who was to be the lead auctioneer. Some attendees showed some distress as the vociferous argument continued and were quite relieved when, from out of nowhere, Superman appeared! The caped crusader quickly took control of the situation and negotiated an agreement between the warring parties. With all issues settled, the auction got underway. I must admit that this year we were fortunate in having an excellent array of donations. Some of the items sold were: hand made candle holders, maple syrup, Best Buy gift card, hand crafted wooden toys, teak deck planks from a battleship, dried cherries, Steinaker hats and shirts, American flag, Navy Monopoly game (real interesting), oranges-grapefruit, Lone Sailor statue, Victory at Sea tapes, framed Steinaker picture, gift basket with wine, stuffed dog and UConn T-shirt, a book of Texas history, 2 mystery gifts which made the auction real interesting! (special thanks to Dave Lane, I’m sure he appreciated his mystery gift which if nothing else will enhance his sartorial splendor), a photo of Lower Antelope Canyon AZ, his/her virgin acrylic Tin Can Sailor blankets, candles, books and a Jacksonville area gift basket with local wines and gifts. As the auction proceeded it was evident that this was a special evening, notwithstanding the fact that during a lull in the action my 4 year old granddaughter Oona yelled out to me “Papa, you need new material.” I’m not sure whether it was our skill at auctioneering, our comedic ability or just the inherent generosity of our shipmates that carried the day. I suspect it was the latter. In any event, upon taking a tally, it was revealed that we had set an all time record. In fact, the money raised was over twice the amount raised last year! We have a nice nest egg to really go all out for our 20th reunion in Virginia Beach in 2012. A special thank you is in order for all who donated, participated, purchased and attended this reunion. I think we all understand the camaraderie and bonds that have been forged over the years and just how important it is. have ever considered joining us ...do it in 2012. This will be the 20th year and we are pulling out all the stops for this monumental occasion. No expense will be spared and the memories will last you a lifetime!